In game 2 of last night’s All-Star match between Korea and China, it seemed the latter had just secured a 2-0 sweep of their opponent, downing all five opposing team members. But the Chinese all-star team forgot about the sixth man: the minions. While champions, the player-controlled avatars in each match of League of Legends, run around getting gold and powering up, a set of computer-controlled minions spawn every 30 seconds. They run down each lane, mindlessly driven towards whatever target is put in front of them. Often, minions are the cannon fodder, but in the match between Korea and China, they finally got their chance to shine. While China and Korea were busy fighting in the middle of the map, Korea’s minions had garnered a swell in the top lane, surging into the other team’s base. 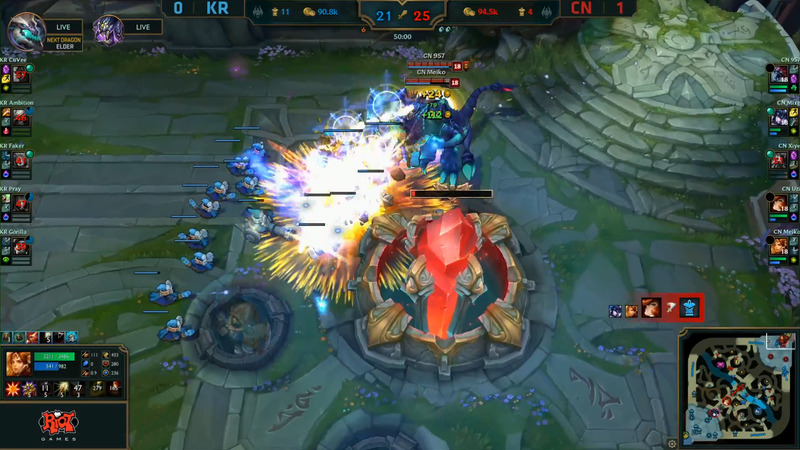 League of Legends is won by killing the enemy team’s nexus, and so while China was barreling for Korea’s nexus after a team wipe, Korea’s minions were slowly but surely beating down China’s nexus. The All-Star matches wrap up later tonight, and you can catch the games on the Riot Games Twitch channel.